Hi matcha and chawan -ofiles. I thought it might be fun to have a place to share our morning's matcha and chawan with some pics. 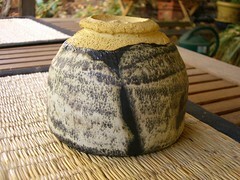 This one is by Master Ronin Ceramurai, a soft matt black, ash glazed, rabbit's fur chawan. This was my mornings matcha today. Last edited by Seeker on Nov 20th 09 6:23 am, edited 1 time in total. I realize that I didn't capture the matcha very well at all in that pic! Here are some pics to remedy my boo boo. We've already got a chawan thread, I'm not sure if we need two. That said, I've seen that one on his etsy page, and kinda wanted to see some more pics of it, so thanks. Shuweet Seeker. I have been eying Ronin Ceramurai's works for some time. I respectfully and wholeheartedly disagree Margules - I think we'd be just fine with another chawan thread - and not just a chawan thread mind you, but a chawan AND matcha thread. Also, I am well aware of and participate in the thread you referenced, and it is titled to be specifically for "favorite" chawan. I had the thought that such a title may limit the chawan we get to see/share, and since I love & adore chawan (and hope I'm not the only one) -- my passion makes me want to see more of the chawan of others, the matcha in those chawan, the matcha coated chasen and possibly chashaku, etc. And it would be sooo, so cool to see the various chawan our esteemed TC friends/compatriots have collected and love. Perhaps there could even be comments about why this particular chawan on this particular day? It warms my heart to sit and sip from this day's chawan, this days matcha, and know that others, perhaps even at the very same moment, might be sipping too. And I find that making a little connection and perhaps even sharing some kind acknowledgment with each other is sustaining. Another thought I had, was that newly acquired/purchased/found chawan might get on the favorite thread for their novelty; but I noticed the thread dropping away, not getting any attention, maybe because this difficult economy might have prevented much chawan acquisition -- and so I wanted to open up a thread that included all chawan, old, ancient, borrowed, given, bought, found, whatever. Thank you for your kind acknowledgment of the "Rabbit's Fur" chawan. I'd like to see your Tebineri Kyusu, aka "da bomb" sometime - but I know that'd be another thread (probably already posted, but I missed it). Just got the two new matchas from Zencha in the mail! Little to late to try them out right now... I also just got this nifty whisk from Yuuki-Cha http://www.yuuki-cha.com/Organic+Matcha ... ama+Chasen Really excited to try it out and compare it to all those cheap Chinese whisks I've gone through. Nice looking whisk. I'd love to know how it works out for you. I think mine is Japanese (not sure, purchased from my local tea shop) and it's still going strong! Did you get an organic Matcha from Zencha? If so, I'd really, really like to hear about it. I just finished a can of horai from Ippodo (wonderful stuff!). 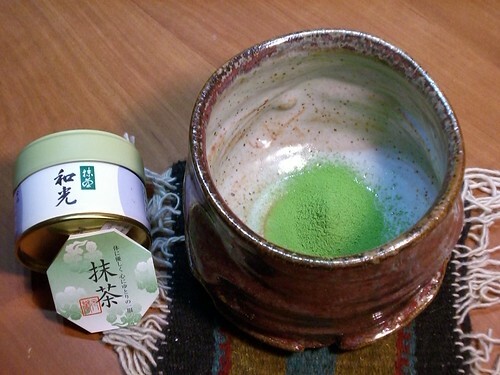 I'm currently working on Yame Matcha Sansui from Zencha - I like it. But I have to say - the Ippodo I like better. This morning's matcha is yame matcha sansui from zencha. And the chawan I'm using is a newly arrived shyrabbit red. Interesting, yesterday the yame tasted a bit nutty, and yet today, very green and grassy. But then today, I was not so aware of the temp I was using. Cheers, and my our respective days unfold well. 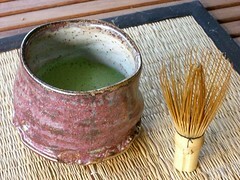 Seeker wrote: This morning's matcha is yame matcha sansui from zencha. OOOOOOOOOHHH! That's a beauty Seeker! Love the color! The Mod and I usually share matcha in the afternoon, guess we should rethink it and try it first thing in the morn. This week we had the Sansui from Zencha at least once, I recall the very green but veggie flavor and do not remember a nutty nuance. It's cool how different palates and temps yield remarkably different results! Thanks for sharing. Ah yes, I too had the Sansui! Very good, kinda hard to describe the taste. Prepared as an Usucha, seemed my new whisk made all the difference. Though this is my first experience with a matcha of this quality, it seemed a lot fluffier, lighter, frothier, with my new whisk. I also got the Sasumi which I'll be opening later. >guess we should rethink it and try it first thing in the morn. If Chip has problems with malty Assams causing nausea in the morning, you may want to rethink plans for matcha in the morning. As stated somewhere else - I am sort of a chawan/matcha whore (though I admittedly have much to learn! 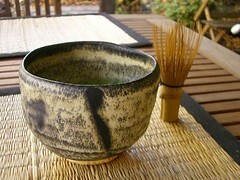 ), so I would be delighted to see/hear about matcha and chawan that is enjoyed any time of the day. And I want to reveal that, at least in part, Cory Lum (aka bonjiri) is my inspiration for this topic. 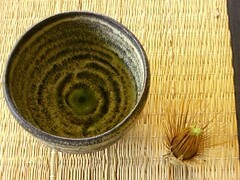 I noticed that sometimes on his artisan thread he will showcase a new chawan with a "this morning's matcha". So here's to you Cory! Mahalo!!! 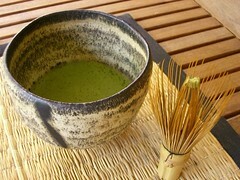 Hope you'll share with us some of your morning's/day's matcha. ps - Intuit - I love the new Avatar. Yeah, posted that in either the showoff topic or the Hagi topic, or the teapot topic, or all three. I will have to look. guitar9876 wrote: Ah yes, I too had the Sansui! Very good, kinda hard to describe the taste. Prepared as an Usucha, seemed my new whisk made all the difference. Though this is my first experience with a matcha of this quality, it seemed a lot fluffier, lighter, frothier, with my new whisk. I also got the Sasumi which I'll be opening later. My morning/day matcha is Wako today. Thought I'd post a "Mt. Fuji" pic. Chip - you make the Kasumi sound oh soooo good. >ps - Intuit - I love the new Avatar. Thanks Seeker. My Cookie Monster avatar was customer created for me by an artist buddy. Using it in honor of the 40th anniversary of Sesame Street. I am not cookie adverse, however.